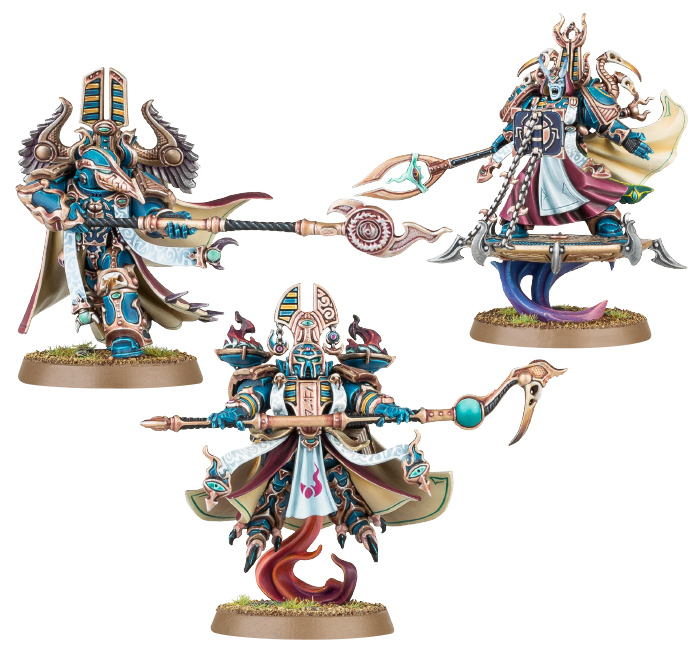 It’s another week of Change over at Games Workshop, as we enter the third week of Tzeentch releases for Age of Sigmar! After the human cultists and the beastmen, we’re now in the realm of the daemons, including the previously previewed Lord of Change / Kairos Fateweaver. This week’s releases, while exciting, are predominantly re-packs, however. 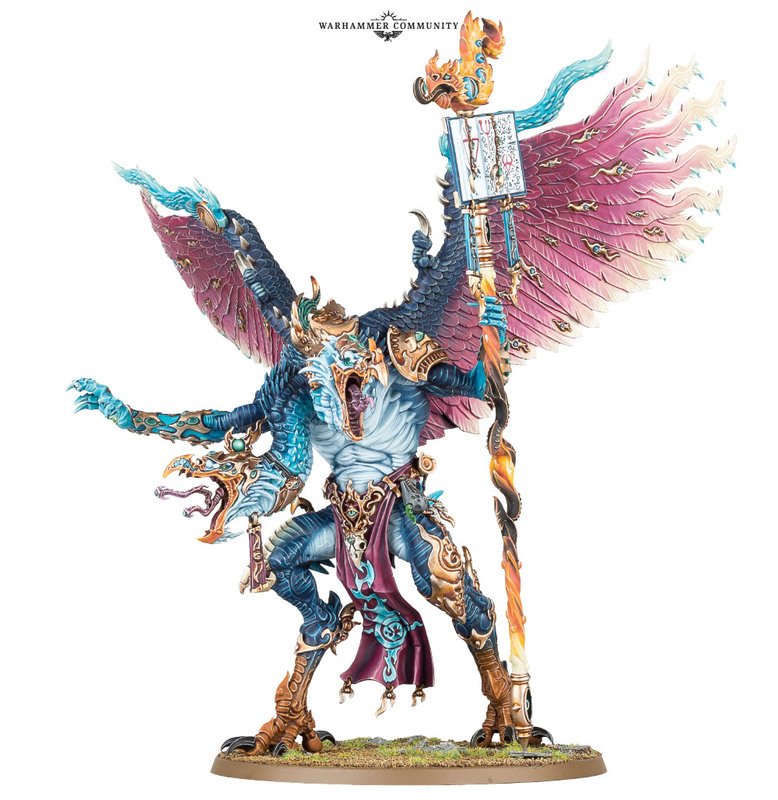 From what I can tell, we have the new Lord of Change, and the Blue/Brimstone Horrors that we’ve previously seen in Silver Tower, but the rest of the range is the pre-existing stuff from back in the day, such as Flamers, Screamers, and Pink Horrors. Bit of a shame that those two “new” Pink Horrors from the boxed game haven’t made an appearance, but I guess they have to keep something in these boxes to prompt folks to buy them! 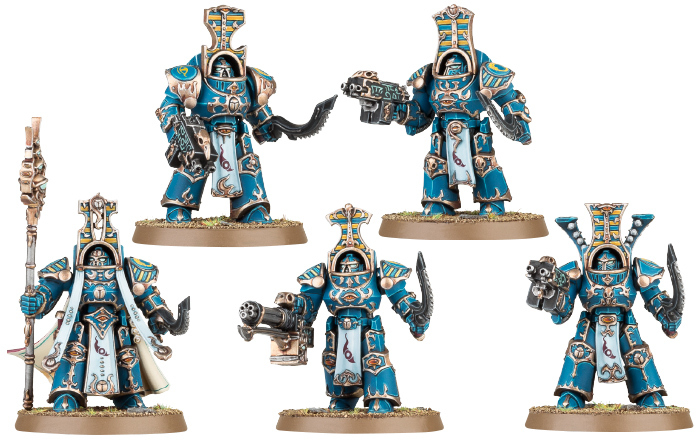 While I might sound a bit down on the release, I do actually like the fact that they’re slowly getting round to re-packing all of their minis in the new stuff, so we have a more consistent look and all the rest of it. 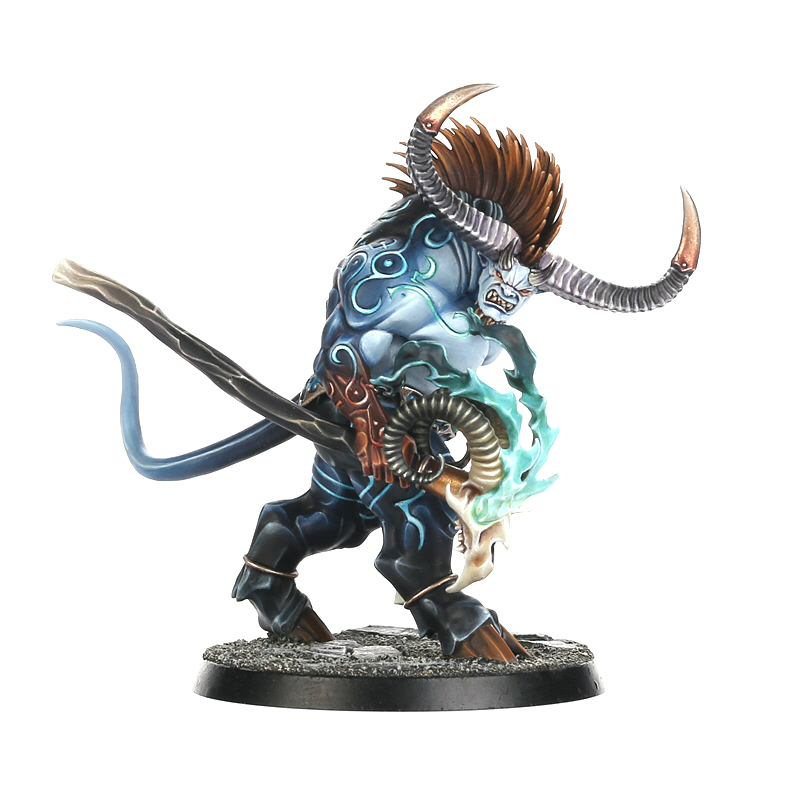 There’s also a new Start Collecting box for Tzeentch daemons, which is good to see! I’ve been toying with the idea of getting more bits to flesh out my Silver Tower enemies for a while, so it would be a good way to do that! It looks like this is the end of Tzaanuary now, however, with February once more bringing new Stormcast Eternals to the Mortal Realms. I mentioned these the other day, the so-called Rangers of the Stormcast forces, and we’re seeing some more of these guys now, with another Lord Celestant type miniature, the Lord Aquilor (above). 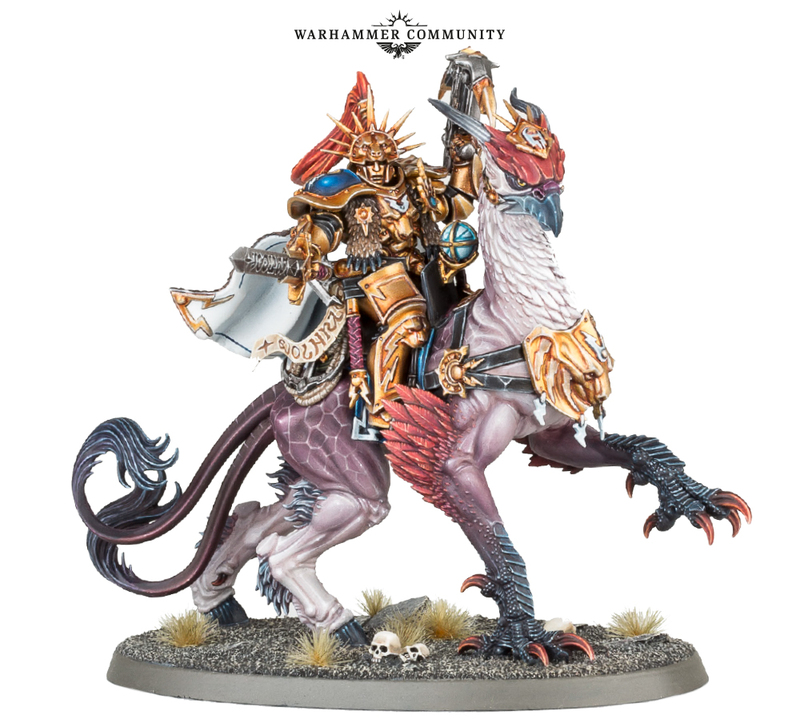 Gryph-hounds have always struck me as a bit silly, and I’ve previously used High Elf lions to replace them with my Lord Castellant, but with this new batch of releases… I don’t know. It looks to be a bigger release than last year’s Extremis Chamber, which only gave us the dracoth riders and the stardrake of course, but so many silly animals have left me feeling a bit disappointed, overall. I’ve picked up the new Gangs of Commorragh boardgame, and I’m very excited for more Dark Eldar, so expect a first look at that bad boy on this Tuesday’s game day blog! I must admit, I’ve been really slow with painting stuff so far this year, and the purchases in the above instagram picture are kinda unnecessary really – I still have the first Venom only partly painted, after all! I think moving from weekly to monthly painting update blogs may have been a bad move, but keep your eyes peeled for the January update in the next few days, where I’ll talk about this more. While I may have been slow in getting anywhere with painting them, however, I am still very much enjoying the Dark Eldar miniatures! Age of Sigmar isn’t the only thing to experience Change at the minute, anyway. I’d like to get a little more philosophical for a moment, as I’ve been thinking a lot about the future of late, as is often the case at the start of a year. In 2017, I’m going to be moving house, and while I’m currently renting the flat I’m in, I’ve decided to actually buy myself a house and move away from where I am currently. Naturally, then, I’ve been looking to downsize a lot of the stuff that I’ve managed to accumulate in the time that I’ve been here, to say nothing of what I’d accumulated prior to that! One of the biggest cuts, therefore, is the boardgames that I’ve amassed. I’ve been slimming down the collection for a while now, and games that have previously featured here on my game day blogs have since been sold on ebay – who knows, you may be reading this having bought one of them! But while I’ve been doing so fairly infrequently up to this point, I think it’s time to really trim the fat now. While I have no intention of cutting back on game day blogs, as it’s one of my favourite aspects of my blog, I suppose it’s entirely possible that there may be a narrowing of focus as my collection shrinks. After all, pretty much every game day blog features a game that I personally own and have played. I think I might try and do more session report type blogs, though, rather than merely churning out review type blogs all the time, and see if I can mix things up a bit! I’d also like to do more news-y type game day blogs, which I did try towards the back end of last year, but haven’t really done that many since. At any rate, if you’re a regular reader of this here blog – first of all, thank you very much! But let me know if you have any views on these thoughts, as I’m still very much in the sort of planning stages of everything! For now, at least, the first look at Gangs of Commorragh will be coming up this week, so it’s not about to change overnight! Author spalanzPosted on January 28, 2017 Categories board games, WarhammerTags Age of Sigmar, board games, Dark Eldar, Stormcast Eternals, thoughts, TzeentchLeave a comment on So much change! It’s well and truly Tzaanuary, with this week’s pre-orders up on the Games Workshop website! There is a lot of amazing stuff coming out over the next few weeks, it seems, which has once more gotten me excited to see the evolution of the Warhammer Age of Sigmar game and setting! The new Battletome sounds like it has a lot of awesome stuff within its pages, not least the new lore that is set after the Realmgate Wars that we have been in for the last eighteen months. 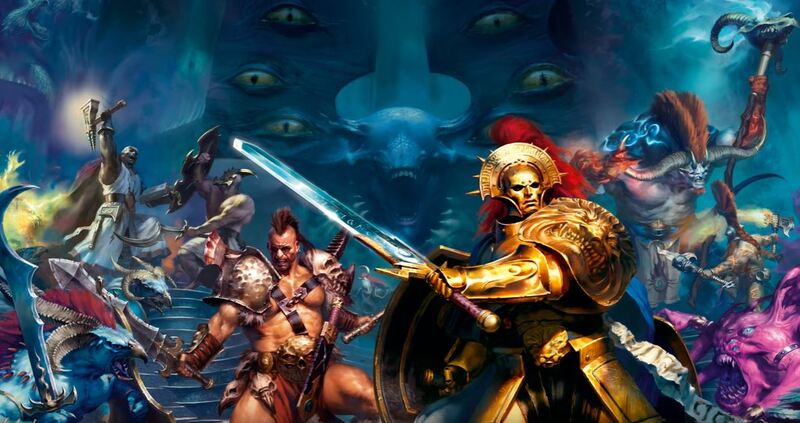 Following the triumph of Order in last summer’s global campaign, it sounds like the mortal realms have begun to settle down into something resembling normal life once more, with the rise of cities and so forth. However, the insidious forces of Tzeentch have taken a hold, which is going to be explored in the new novel, City of Secrets. These guys do look amazing, and are certainly a step up from their incarnation in the boxed game. I’ve not really been following the rules for them, but based on appearances alone, I am sorely tempted to get myself some! 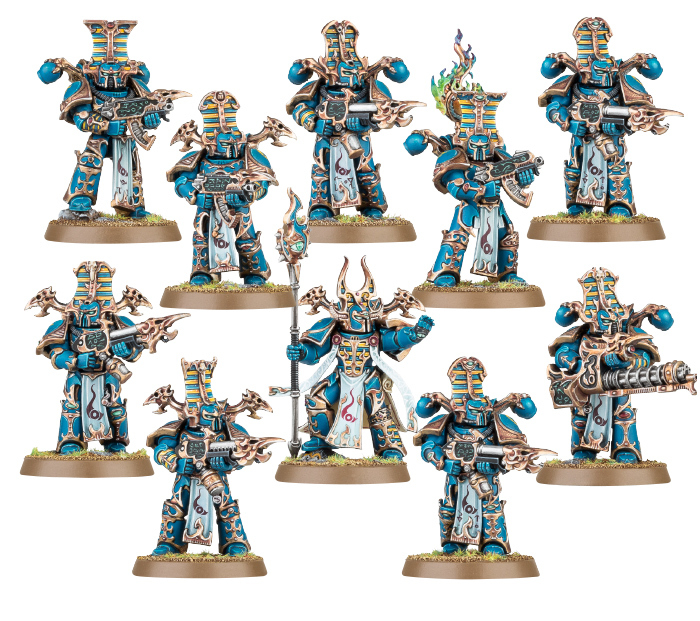 We’ve got a couple of champion-types, but the big stuff looks to be set for next week and beyond: the new Tzaangors, Changeling, Blue Horrors, and of course, the “miniature” that everybody’s talking about, the new plastic Lord of Change / Kairos Fateweaver, himself! While the long-rumoured plastic Lord of Change is therefore real, let’s hope the similarly long-lived rumours of a plastic Keeper of Secrets can come true soon enough, as well! Author spalanzPosted on January 16, 2017 January 15, 2017 Categories WarhammerTags Age of Sigmar, Chaos, Tzeentch, Warhammer1 Comment on Time for Change! 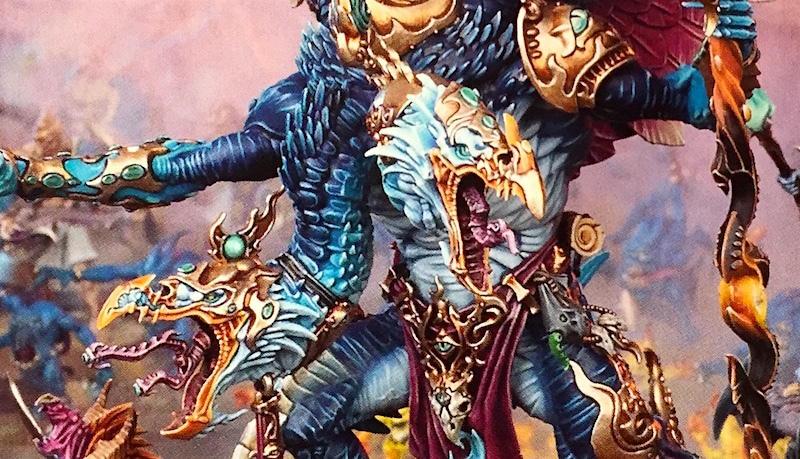 It’s been a few days now since Games Workshop dropped all the news about the forthcoming Tzeentch-related goodness that is coming our way in the new year, and I’ve finally gotten round to digesting it all! I’ve kinda been neglecting Age of Sigmar for a while now, what with all of the amazing 40k releases coming from Nottingham. Following the Season of War campaign that took place over the summer, and the defeat of Chaos by the forces of Order, it looks like the mortal realms have been fairly settled for a while now, as cities are built and human populations have been moving back. All of this seems to be detailed in the upcoming battletome, Disciples of Tzeentch. This sounds like a great addition to the lineup of AoS books, apparently created from community feedback. Sounds like it should be a lot of fun, anyway – I’ve been a big fan of the Age of Sigmar books, so I’m looking forward to seeing what’s in this one. 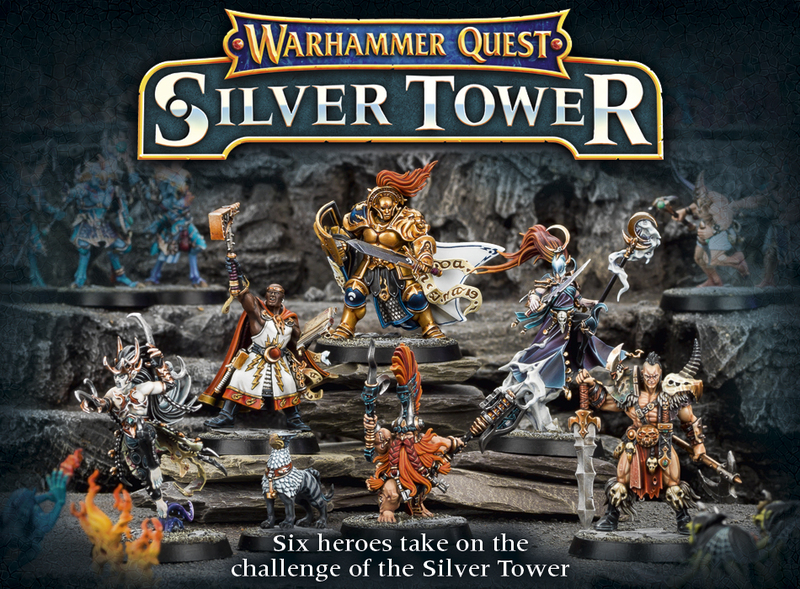 It looks like the stuff from Warhammer Quest Silver Tower is coming into AoS formally – there are already warscrolls for these chaps available of course, though it looks like there are going to be some significant upgrades and stuff for the Tzaangors, at least! The Kairic Acolytes were some of my favourite things in Silver Tower – Ogroid Thurmaturge and the new Pink Horrors, notwithstanding! Of all the upcoming releases that we’re expecting, I’m most looking forward to seeing what we get of these guys. 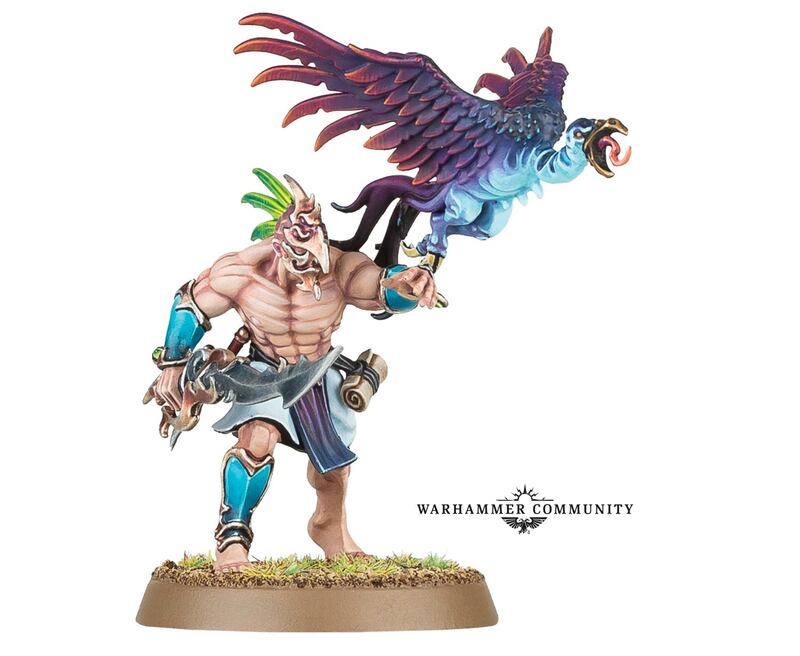 New Lord of Change be damned, I want to see what these guys have to offer! Out of all of this, of course, we’ve also been told that there will be new human populations for the mortal realms in the wake of Order’s victory. I’m assuming that means we’re actually going to have some new chaps for the Free Peoples, which could be pretty exciting! Looking at the other rumours that have been doing the rounds for a while now, I think I’d trade all of this stuff for the idea of a plastic Keeper of Secrets! Author spalanzPosted on December 28, 2016 December 27, 2016 Categories WarhammerTags Age of Sigmar, Tzeentch, Warhammer2 Comments on Looking forward to Tzaanuary! In a surprise move, I’ve picked up this bad boy at the weekend and, while I haven’t yet gotten around to either assembling/painting the miniatures, or playing the game any other way, I have been doing a little research over the weekend, checking out the rules and reading the interviews and articles in the recent White Dwarfs. I have to say, I’m pretty excited by this game, so wanted to feature it here on a game day blog despite being only a first-impressions thing! But I’ve done that before, not least with the last boxed game from GW, so hopefully you’re all used to it by now! First of all, as with all of these sorts of things, let’s talk about the little plastic guys inside the box here. There are six heroes: a Stormcast Eternal (who was another prime motivator in my buying this game), a Chaos Barbarian, a Dark Elf, a High Elf, a Warrior Priest, and a Fyreslayer. I think the most important thing here is that we have the first incarnations of the new elves of Age of Sigmar, and I have to say, those miniatures look beautiful. I was even thinking I might start collecting some when they have their main release for the game, but I think I need to resist there! The Chaos dude and Fyreslayer are both similar to those we’ve seen for previous releases, and the Warrior Priest has that classic look from the World-That-Was, but updated slightly. Oh, and he comes with a mini gryff-hound, which I think is adorable! In terms of the bad guys, I think I’m more in love with them than any of the heroes! First of all, the Gaunt Summoner is similar to the previous model released last December as part of the Everchosen releases. GW have said they wanted the model to be similar but different to the earlier guy, and I’ve heard a lot of folks at my local store saying they prefer this one to the earlier model. Someone has even said they’d get two boxes of this, one to have as the game and another to just use pieces in Age of Sigmar, specifically for the Summoner and Pink Horrors. Pink (and Blue) Horrors are some of my favourite aspects of the Warhammer universe. Much like orcs and goblins, there is something delightfully British in the sense of humour that comes out of the guys who design this stuff, I have to say! Pink Horrors are just happy, capering guys who fling pure magic from their fingertips, but if you manage to kill one, it will split down the middle and make two Blue Horrors. These are much more surly and grumpy, mainly because they wish they could be a Pink Horror once again. I can’t hear that backstory without a huge grin on my face! It’s so cute! The quality of these miniatures is just amazing – there are two Pink Horrors in the box, and I’ve heard them described as “the pinnacle of their being”, so they’re really a lot better-looking than the box of troops you can buy for a demons army. The Familiars are just adorable – things that have been in the lore for a while now, but that have never seen models until this release. The Gaunt Summoner is accompanied by four of them, and they caper about the Silver Tower, cursing the heroes if they fail to catch them. Pug is the moon-faced guy holding a Stormcast helmet, Slop is the walking fish, Blot is the walking book and probably my favourite, and Tweak is the tiny little imp convinced he is a Greater Demon of Tzeentch. It’s all just so adorable! The main footsoldier-types are the Tzaangors and the Kairic Acolytes. These prowl the corridors of the Silver Tower along with all manner of other weird stuff, including Grot Scuttlings – cursed goblins who are slowly turning into spiders – and a Skaven deathrunner. Prowling over them all, however, is the Ogroid Thaumaturge, a huge hulking beast with magical runes inscribed over his body. I am really excited by this miniature, as he looks like an absolute beast to put together and paint! The miniatures are just beautiful. Some of them have that Age of Sigmar starter set weirdness to them in how they’re assembled, but they nevertheless seem fairly straightforward to put together. The heroes will probably want more time spent on them, but I’m guessing that some of these minis – the demons in particular – will be painted fairly quickly. Paint Splatter in White Dwarf this week has a double-page thing that just has a paragraph on each, it sounds super-easy to do. I’ve talked about these minis long enough now probably – though they’re just so beautiful! – so what else do we get here? A bunch of dice, of course, and hero cards for all six heroes included. There four sheets of die-cut tokens and map tiles, the usual thick cardstock of, say, Space Hulk, which feature gorgeous artwork for the interior of the Silver Tower. We also have two decks of cards – treasures/skills the heroes can come across in the tower, and map cards that determine what room you move into. In addition to the rulebook (and minis assembly guide) there’s an Adventure Book that I’ll get to shortly. The rulebook has the rules for all of the monsters in the game, which are controlled by an AI that sounds fairly straightforward. 1) Destiny Phase, where the first (“runemarked”) player rolls five destiny dice and places all of the unique results on the fate board – this all sounds rather grand, I know! Any doubles that are discarded then trigger the Familiars to do stuff. 2) Hero Phase, where each hero rolls their four dice and places them on their hero sheet. There are three basic actions a hero can take – move, explore and recuperate – as well as those actions described on the hero sheet. To use these actions, players spend dice that have at least that score – so to use the Stormcast Eternal’s Challenge (2+) ability, for instance, you need to allocate a die that resulted in at least a roll of 2. All of the basic actions cost 1, so they should always be available, though recuperate moves up a step each time you use it, making it difficult to heal yourself as you move through. In addition, players can use the destiny dice that were set aside earlier, though there are mechanics that prevent the first player from always using the best. Exploring is really cool in this game. If your hero is stood at an unexplored exit, he can explore the next chamber by drawing from the exploration deck, and setting that chamber tile with one exit lined up with the exit he is exploring. These cards also have some text to be read aloud, and an encounter that will happen when the tile is revealed. The encounters are split across four tables, which usually describe the enemies that will be found there, but there are also Unexpected Events that might occur, and this is where the Adventure Book comes in. Much like Tales of the Arabian Nights, there is a choose your own adventure feel to this book. To resolve the encounter, you roll two d6 and determine the result using one die as tens and one as units, so a roll of a 3 and a 4 is determined to be 34. You then read that passage of the book, which can either be a boon or a bane for the heroes. There is an element of the silly Age of Sigmar rules here – flicking through the book, I came across one entry that allows a player to act out the answer to a riddle, for instance. But in the main, the book is a really beautiful, thematic addition to a game that is more concentrated on creating amazing experiences for the players than anything else. Moving through the gribblies in the tower, you’ll want to attack them of course. Combat is quite straightforward, as you roll dice and compare the result to your weapon’s attack rating – if you equal or exceed that rating, the attack hits and the adversary suffers damage. Each enemy has a vigour rating that describes how much damage it can take, such as the Gaunt Summoner’s rating of 9 (of course!). For each enemy you kill, you gain one point of renown, also tracked on the fate board, though each hero also has other ways to gain renown. Once you go all the way round the renown tracker, you gain a new skill. This is a really nice leveling mechanic of the sort I love in games! 3) Adversary Phase, unsurprisingly, is where the enemies fight back! Much like in the D&D Adventure System games (Legend of Drizzt or Wrath of Ashardalon, for example), adversaries have a behaviour that is determined by the first player rolling a d6. This largely controls movement for the enemies, bringing them closer to the players to attack, but is done in the order determined by the first player. Some enemies will bring forth others – the Kairic Acolytes can summon a Pink Horror, for instance – and these new enemies will act this turn if their group hasn’t already done so. There is an element of strategy involved in who to have act first, at least. 4) End Phase, where the first player changes, and the Silver Tower changes. As the game progresses, the chamber tile where the heroes are remains in play of course, as well as any tile connected to it, and any tile connected to that one. Any other tiles are removed from play, and their exploration cards discarded, possibly to come up again later in the game. Something I find hilarious is that the current chamber is described as the tile where the majority of players are – it’s possible that a hero might be lagging behind, perhaps pinned by a monster that just won’t die, and so that hero might in fact be removed along with the chamber! This feels really intuitive to me, being used to the D&D system games, and allows for a fast gameplay that makes for some really great storytelling. This is really what the game is all about, as the designers stated in the latest White Dwarf. The rules are kept straightforward and as simple as they can be, so that players can tell the story of what’s happening with their character. It’s a really cool design decision, I feel, as this kind of adventure game really is more about the story you tell than merely throwing dice and killing monsters. There is so much here, I can’t begin to praise this game enough. This is the fifth boxed game to come out in recent years from GW (if you count Betrayal at Calth as the game it purports to be, and not merely a repository for plastic Heresy-era minis), and I think it’s by far the best yet. Deathwatch: Overkill impressed me no end, but this is a game that I feel like I can play right now – and, indeed, I want to! Rumours have been flying across the internet of how this will become a main-line for Games Workshop, and while I was initially sceptical about such a move, I think I can see how they would make that so, and it wouldn’t surprise me moving forward. Again, looking at the rumours that have been circulating for previous boxed games, we’ve seen how people speculated on Space Hulk getting an expansion, how Betrayal at Calth was supposed to be getting support but that now seems to be a follow-up, standalone game, and who knows what’s happening with Deathwatch. But Warhammer Quest seems to be a game they’re pushing for some level of customization, which is easy enough to do given they already have the models in stock. Next weekend, the Mighty Heroes expansion brings four new heroes to the game, and the rulebook already features the hero rules for all four of them. The Adventure Book also features rules for four more adversary groups – classic Tzeentch monsters such as the Flamers and the Screamers. I’ve actually succumbed already to this and have ordered a box of Flamers, in part because they’re surprisingly cheap, but I’m also considering getting a Burning Chariot or something as well. In games like this, variety is a huge positive, of course! This first impressions has gone on long enough now, so I think I’m gonna leave it there now. However, suffice it to say, I’m really impressed with this box. The minis look absolutely incredible, and the gameplay looks to be pretty solid and enjoyable. My local GW is going to start running a game night specifically for these games, so I’m intending to jump on that and get at least a hero built up and ready to join in there. Moreover, I’m hoping that, next weekend, I can make a start on assembling some of these critters, so look out for a hobby progress blog to feature some of that! Author spalanzPosted on May 14, 2016 May 15, 2016 Categories board gamesTags Age of Sigmar, Games Workshop, Tzeentch, Warhammer Quest3 Comments on Silver Tower awesomeness!